Bernardinu B&B House could be classed as one of Vilnius discount hotels when comparing with some other hotels in Vilnius Old Town. The excellent location and pretty, comfortable rooms make Bernardinu B&B good value for money. Bernardinu B&B House stands on a charming secluded street in one of the oldest parts of the Old Town. The location is also very central and convenient as it is only a couple of minutes away from the main pedestrian street with cafes, restaurants and city attractions at hand. 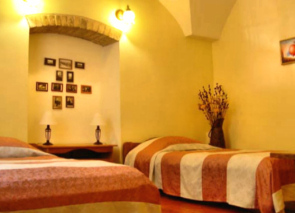 The guesthouse is set in a 17th century mansion with the rooms decorated to retain some of the character of the past. Some rooms have 17th century ceilings and renovated wall paintings. 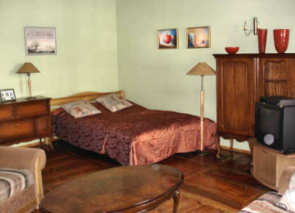 They offer 2 single, 6 double and 2 triple rooms at the guesthouse. When booking the rooms note that some rooms have private bathrooms, while some have shared bathrooms between two rooms. The guest house also organises Vilnius excursions with guides, countryside tourism, arrange tickets to opera and ballet performances, classical music concerts and offer car and bike rental. 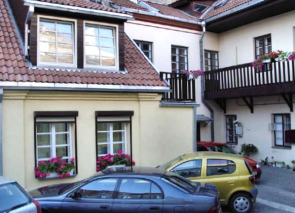 The guesthouse has an inner courtyard, so there is a possibility to park your car. Unfortunately, this hotel is not included in our choice booking company, booking.com that offer discounts, therefore, if you wish to book this hotel see the details below.